Revolutionary War Pensions: What are they good for? Much of the power of McCullough’s writing comes from his ability to recount an event that happened more than 220 years ago and make seem like it happened yesterday. The powerful drama unfolds in an unending series of unique, rich and personal details gathered from extensive research. 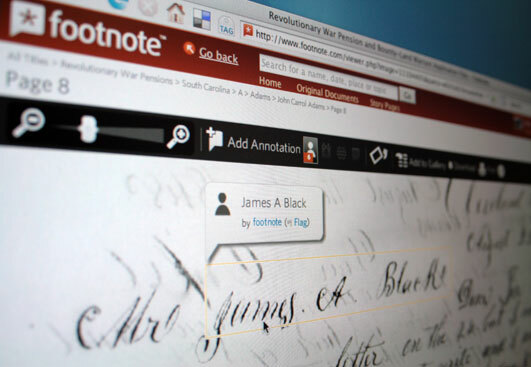 Details like the ones you can now read for the first time online in the Revolutionary War Pension Records. These newly digitized records contain historical information as well as information useful to those researching their family’s past. And each name contains a complete file of pension documentation – usually about 30 pages. The pension records are even more valuable when you consider that most of the original service records and the earliest pension records of the Revolutionary War were destroyed in fires in 1800 and 1814. So we’re proud this week to release the first portion (about 10 percent) of the applications. Soon, we’ll have more than 2 million documents containing 80,000 pension and Bounty-Land-Warrant applications. To those who think this might sound like something interesting only to librarians or doctoral students, take a look inside. When a person applied for a pension, he or she had to appear in court and describe – under oath – their service in the Revolutionary War. Widows had to provide information about their marriage. Each file offers an intensely human story of the brave individuals who sacrificed life and limb to make the ideals of the Declaration of Independence something more than words on parchment. He enlisted in 1776 for one year in Germantown and then marched to Quebec. He fought at the battles of Brandywine, Trenton, Princeton, Monmouth and the capture of Stoney Point. Check out the first-hand account of Mr. Armbruster, just 79,999 stories left to tell. When complete, all of the images and indexes of this collection can be found on Footnote or will be freely viewable at the more than 4,500 LDS Church-run family history centers around the world. Are there any examples of Revolutionary War Pension Coats? Does anyone know what they might have looked like?